I love peanut satay, luuurve it! I’ve made lots of variations of it over the years, pre-whizzy machine days I used peanut butter but now I get the extra satisfaction of really making it from scratch using whole peanuts. You can use satay sauce to pour over meat or tofu with vegetables and rice, use it to marinade chicken before grilling, or as a dipping sauce. This particular recipe is an adaption of a lovely sauce served by one of my favourite restaurants – The Spirit House in Yandina, Queensland Australia. The Spirit House serves Asian style cuisine of the highest standard and they also run a cooking school. The whole place is set in tropical gardens around lagoon. It’s best to go for lunch when you can enjoy the gardens and view. I haven’t been there for quite a while, but as soon as I am back in Australia it will be back on the to-do list! In the mean time, I will have to be satisfied to make my own (which frankly is very good) and now you can too with this authentic peanut satay recipe. I know that the photo isn’t fantastic, you’ll just have to trust me that it’s delicious and imagine it with a few orchids scattered around. That always makes Thai food look more tasty. Add onion to cooking bowl, Whizz 4 seconds, Speed 5. Scrape down any onion that has climbed the sides of the bowl. Add 10gm oil, sauté 5 min, Varoma temp, Speed 1, MC OFF. Add sugar, fish sauce, tamarind, kecap manis, remaining coconut milk, and peanuts. Cook 12 mins, 100 degrees, speed 1. Purée 30 seconds on speed 8. This will keep in the fridge for up to 2 weeks (it will go solid in the fridge). Warm before serving. I serve this poured over steamed chicken, vegetables and rice. I love it with crispy fried onions, fresh coriander and chopped chillies sprinkled on top! It’s a great way to use up left over cooked chicken, just steam some fresh vegetables and rice, add the chopped chicken to the varoma for the last few minutes to warm it through then pile it on your plate. 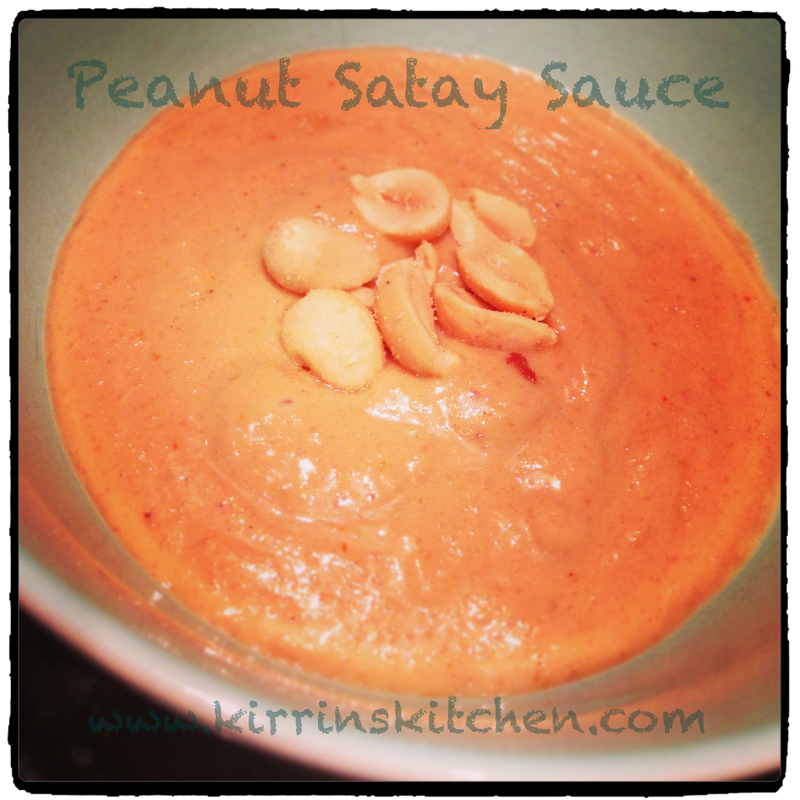 This entry was posted in Kirrin's Kitchen, Mains, Recipes, Sauces, Chutney, Relish & Jam and tagged Chicken, coconut, dairy free, gluten free, peanut, recipe, satay, Sauce, thai, Thermomix. Bookmark the permalink.